CASE Ultra applies sophisticated machine learning and cheminformatics algorithms to achieve its performance. However, those are made available to you in a simple way so that you can get the most using our product. Models are central to the functionality of CASE Ultra, giving it the ability to predict a wide variety of end points. 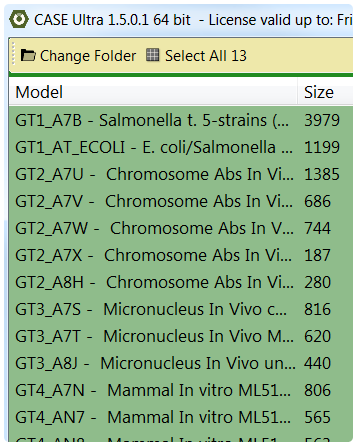 CASE Ultra model bundles are the largest collection of high quality in-silico toxicity models. CASE Ultra supports both Expert Rule based and Statistical Alert based models. Models cover such endpoints as Genotoxicity, Mutagenicity, Carcinogenicity, Cardiotoxicity, Hepatotoxicity and many more. To test a chemical in CASE Ultra, you only need to supply the chemical structure of the test chemical. The steps are: Input the structure, select models, and perform the test. 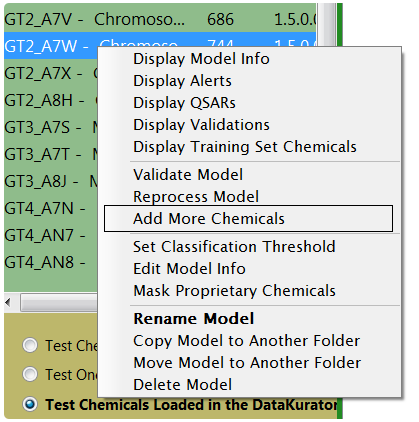 A variety of inputs are accepted for chemical structures: SMILES, MOL files, SD files, etc. You can also use CASE Ultra's built-in molecule drawer. The results of testing a chemical in CASE Ultra can easily be interpreted by a Chemist or a Toxicologist. The results clearly explain why the molecule was predicted to be Positive or Negative. 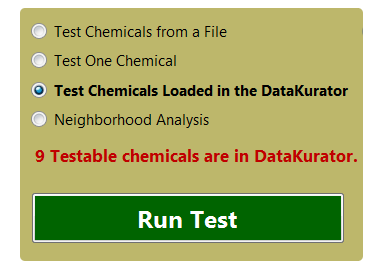 Any identified alert is highlighted on the structure of the test chemical. Statistical calculations are shown in a language that is friendly to Chemists and Toxicologists. Test results from CASE Ultra can be conveniently exported in several popular formats such as Microsoft Excel tables, PDF, Microsoft Word documents, HTML, etc. CASE Ultra's Report Wizard will help you with this. You can build very good models in a surprisingly fast and easy way. A list of chemicals with their structure and biological activity data is all what you need. CASE Ultra discovers alerts in a totally automated way and does not use any predefined fragments or scaffolds. In order to enhance model’s capabilities or to keep it up to date, you can add additional chemical structures-activity data to an existing model. This can be done quickly in just a few steps. 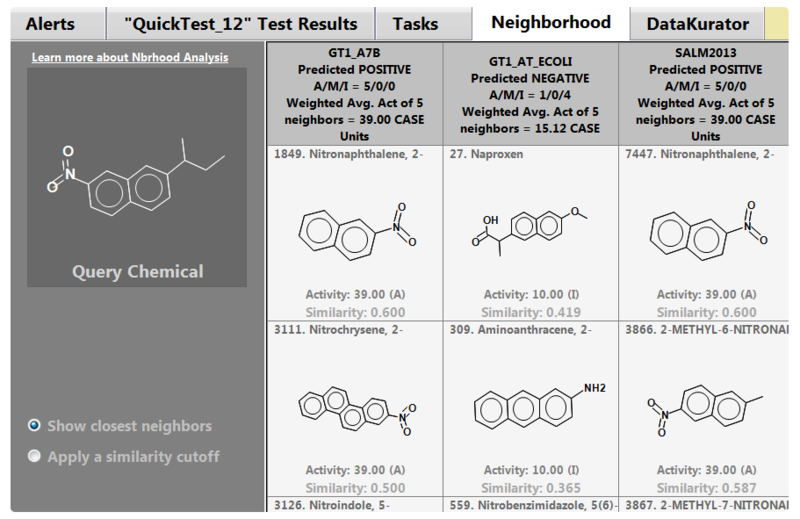 Neighborhood Analysis in CASE Ultra is a convenient tool to identify a model’s training set chemicals that are most similar to a query chemical. It can also be used as a way to examine if the query chemical belongs to the chemical structural space of the model's training set. The results can be used as supportive evidence for regulatory submissions. It is always useful to check chemical structures for errors and issues before subjecting them to a test or model building. The built-in DataKurator in CASE Ultra is meant just for this purpose. It not only identifies problems in the input structures but also provides a very quick and convenient way to correct them.